And so the birthday celebration began this afternoon with a visit from Paul who came bearing bday greetings from Tiffany & Co! They are always so sweet to remember Rudy – their “Tiffany Soldier”! Max and Rolf have an early call in the am for football and the rest of us will head over to the ranch to finish up set up for the Bayou! ‘Such a BIG day!!! Happy Birthday Eve Rudy…we sure are thrilled to celebrate you. Dr. Shapiro (UCLA ENT) called yesterday and we had a helpful phone consultation. Dr. Dan sent her the cath results and she called to congratulate Rudy (love her!!) and talk about a plan to decannulate. She agreed with me that it may be difficult to ever get an accurate sleep study out of Rudy since he is at the age where he will fight it (as he did this last attempt in May)! She said there are cases where she will go ahead and pull the trach without a sleep study. 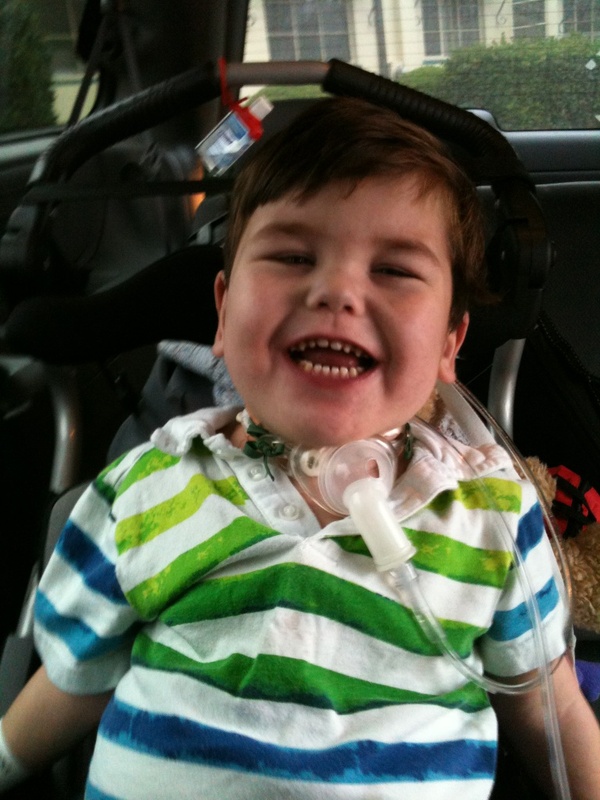 It’s a simple process…she’d want to perform a bronchoscopy in the OR first to make sure his airway is clear, pull the trach there in the OR and then monitor him in the hospital for a couple of days. We’d be very open to going ahead without the sleep study and expect he would do well weaning off the trach so the plan is to resume sprints during the day where we cap the trach (we did these in preparation for the sleep studies). We’ll cap him for a few weeks before consulting with Dr. Shapiro again and then go from there. I just sooo appreciate Dr. Shapiro and her initiation with me…so often it’s us tracking down the doctors and Dr. Shapiro has always been quick to follow-up with us whenever she’s received new information about Rudy – SO HELPFUL! 🙂 Our appreciation for Dr. Shapiro grew this week when we received this little handwritten bday greeting from her for Rudy – SO SWEET! Seriously, it’s the little things that speak volumes. Rudy is so blessed to have such a gifted team of caregivers both at UCLA and here in Santa Barbara! Okay, we’re off to therapy this morning…Have a wonderful day everyone! After a bit of a discharge delay and a stop at Target in Ventura, Rolf, Rudy and I rolled into Goleta a little after 5pm Friday evening. We greeted the big kids, got Rudy settled and I collapsed on the bed to “stretch my back” which turned into a 3 hour nap! I got up long enough to say “hi” to the kids again, sort and start a load of laundry (in preparation to climb Mt. Kilimanjaro again), shower and unpack at least one bag before I fell back asleep to a very solid night’s sleep! Rudy slept hard too and it was very difficult to wake him up early this (Sat.) morning to take him to yet another Dr. appt for…a flu shot! Poor thing…that’s a rude awakening for a Saturday morning under any circumstances! He took it like a little man and was happy that Wilson decided to tag along as Wilson can make even flu shots funny! 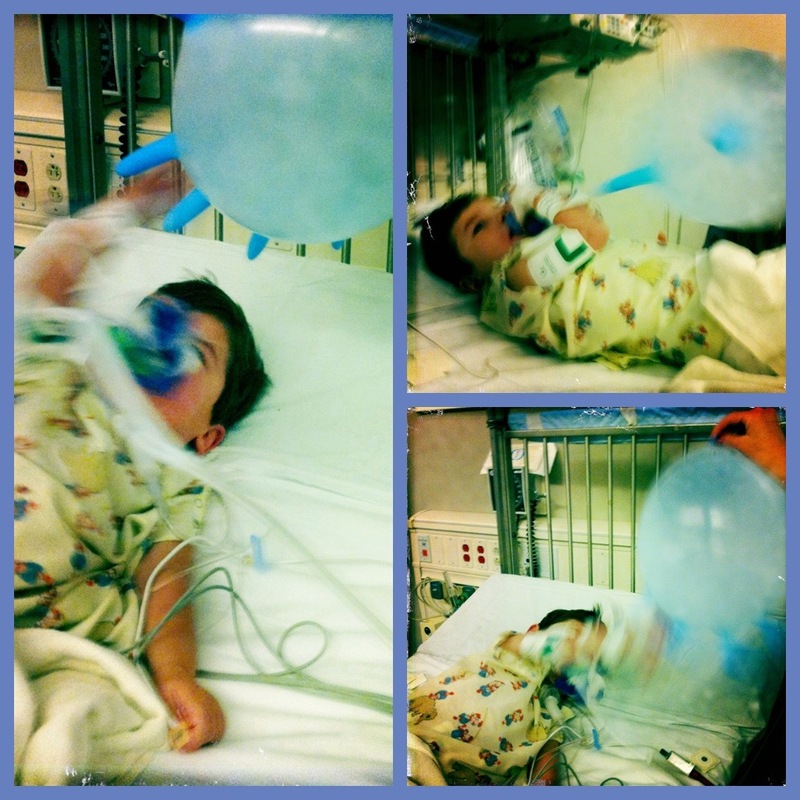 Basically, the purpose of the cath was to take a more detailed look at the condition and function of the heart, determine the O2 saturation of Rudy’s blood coming out of his lungs, check to see if his pulmonary pressures (pulmonary hypertension) have lessened and do any necessary interventions (i.e. close anything off or open anything up). You may recall that the results of Rudy’s last heart cath last October showed definitively that not only had the O2 sats coming out of the lungs not improved but his pulmonary hypertension was worse creating too much resistance for the blood to flow properly…a combination that would make it impossible for Rudy to survive the Glenn surgery (the next surgery to his heart) or a heart transplant. This was particularly disappointing because it appeared the pulmonary hypertension drug treatment he had been on for 6 months at that time (Tracleer and Revatio – aka Viagra) wasn’t making a difference. Because there were no other treatment options, nothing in Rudy’s treatment plan changed this year and, as a result, Rolf and I weren’t too optimistic going into this cath. We were just hoping that his condition wasn’t any worse so it was a bit of a shock (and somewhat surreal) to actually hear good news in our post-cath consultation meeting! Even Dr. Dan said it felt real good to finally report good news after a Rudy cath! We’re still in limbo but it’s a hopeful limbo. In a healthy person, the O2 sats in the blood coming out of each lung is 100%. Last year the sats in Rudy’s blood coming out of the R. lung was 74% and out of the L. lung was 81%. In Thursdays test, Rudy’s O2 sats in the right were 89% and 96% (!) on the left (very close to normal on the left side!). This is significant because it is telling us that the ventilation part of the lung function is healing. The pressure in the lungs is still too high for Rudy to be a Glenn candidate but it’s better…meaning the process is heading in the right direction! The half-a-heart doesn’t look any bigger and is handling the craziness that is Rudy’s body. Bottom line: Rudy’s lungs are better and his half-heart is no worse. 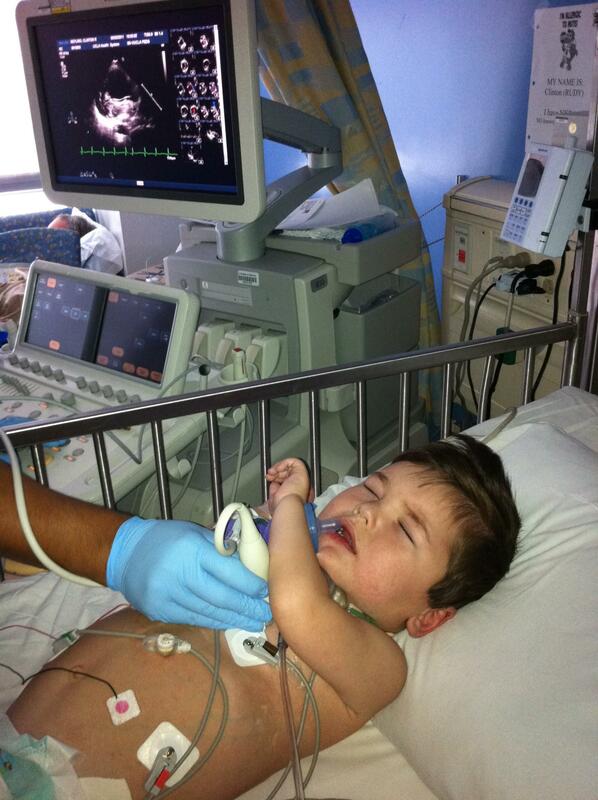 As far as the Sano Shunt that was put in Rudy’s heart during the Norwood procedure (1st heart surgery) goes, it is narrowing but still allowing blood to flow and there isn’t need at this point to discuss putting in a larger shunt. 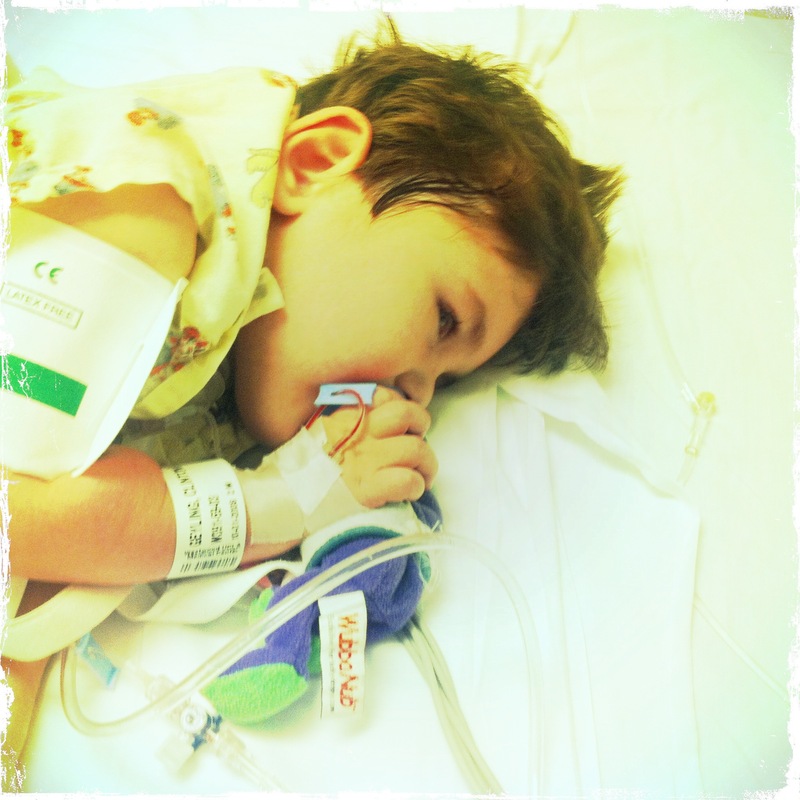 Right now there are two things feeding blood to Rudy’s lungs…the Sano Shunt and collateral arteries that have mutated to create an alternative route of circulation between Rudy’s heart and lungs. This is not an efficient way to circulate the blood (the Glenn would provide more efficient circulation) but it’s working. Rudy’s body is adapting and making it’s own way and for now that’s okay. As long as his half-heart remains strong and doesn’t get enlarged and overworked, the way Rudy’s body is adapting could sustain him for years. Our prayer, though, is that he’ll continue to make progress and ultimately be a Glenn candidate. Drs. Dan and Harake saw the need to control the circulation a bit and performed a balloon angioplasty to open some things up and coiled a couple of collaterals to close other things off. I’m not sure if any of this makes sense but the most telling part of our consultation with Drs. Dan and Harake was their demeanor – we could tell they were pleased (dare I say “giddy”) and that spoke volumes to us. 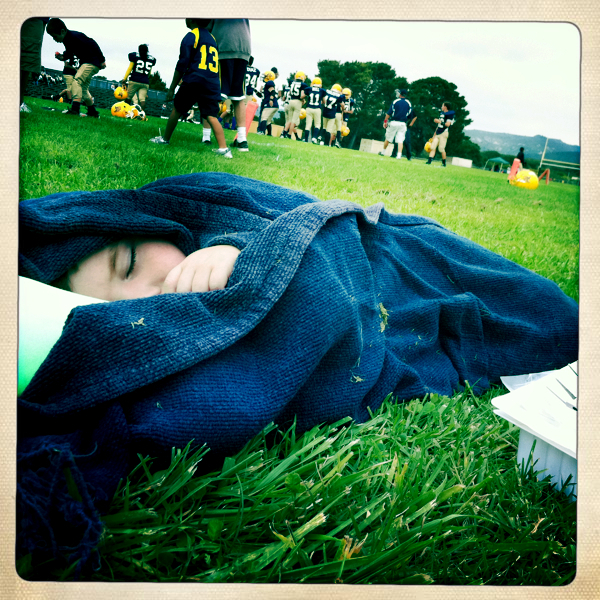 Rudy at Max's football game today...Go Chargers! 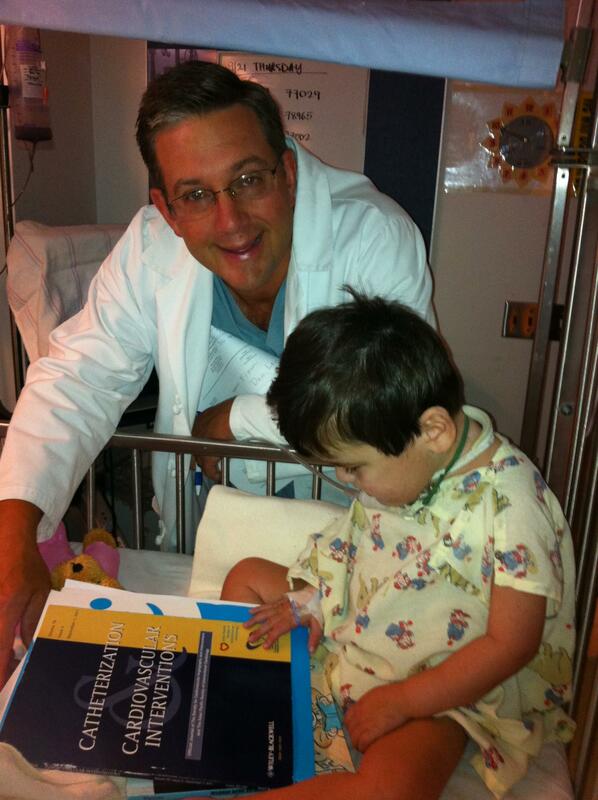 Dr. Dan brought Rudy some reading material this morning during his rounds. 🙂 Rudy had a restless and uncomfortable night’s sleep but he is happy to be sitting up this morning and very eager to get going. 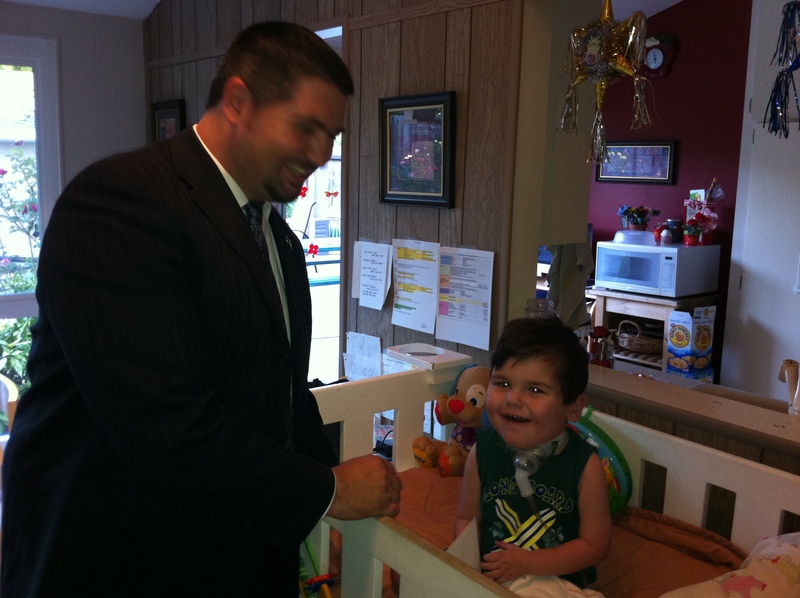 Dr. Dan ordered an echo and said once it is reviewed, we are cleared to go, go, go! We’ll post an explanation of the cath results when we get home! 🙂 Thank you for praying everyone…we are encouraged and we praise God for His continued work in the masterpiece that is Rudy! Not sure if it’s due to improved lung function or just age and experience, but Rudy’s Udderball skills have blossomed! Waiting in recovery for our room assignment. Short on things to do. Just had a long consult with docs. 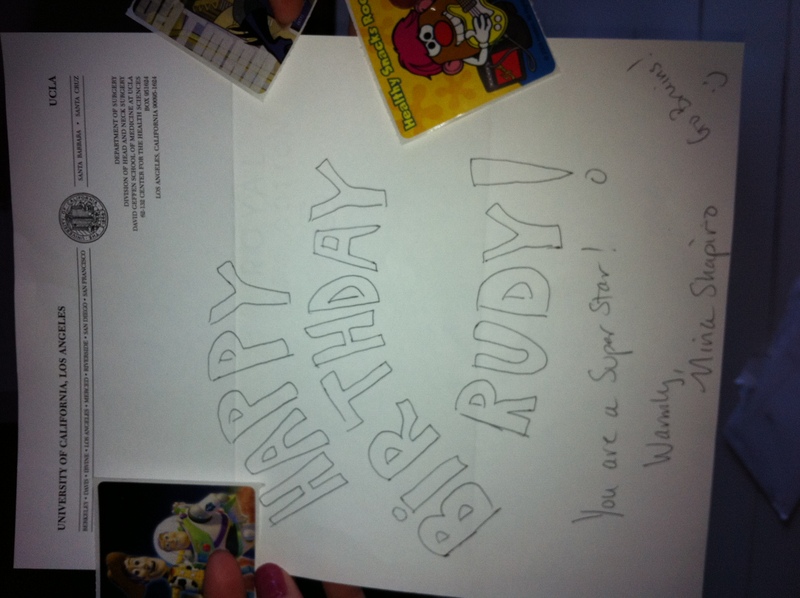 So grateful for such incredibly gifted people who care so much about Rudy. More details later. We’re here for the night and probably won’t get to post much in depth. Just loving being here with this incredible kid. Thanks for praying.